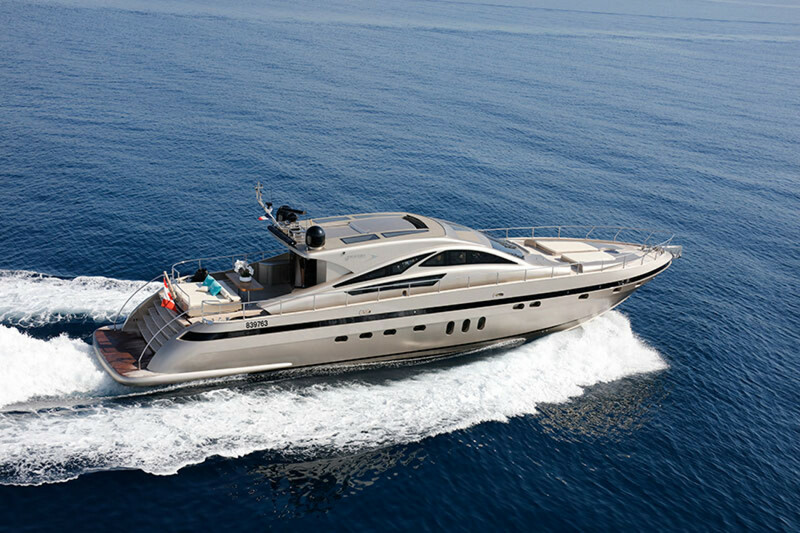 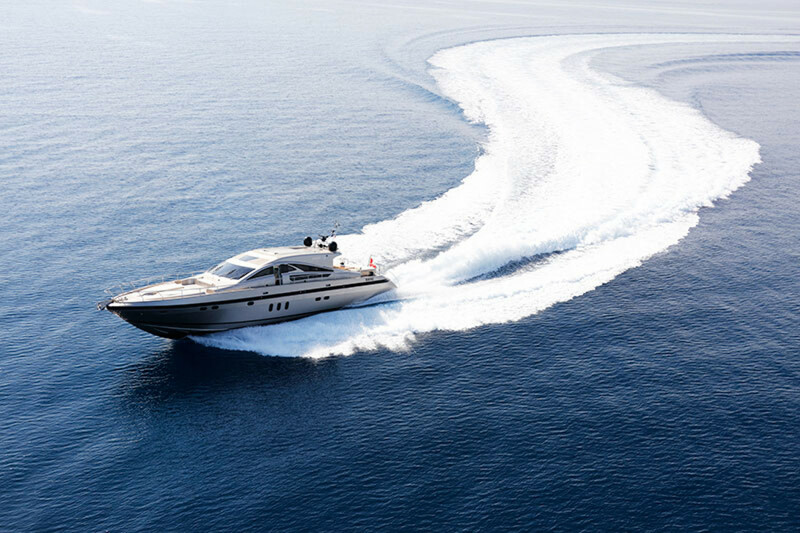 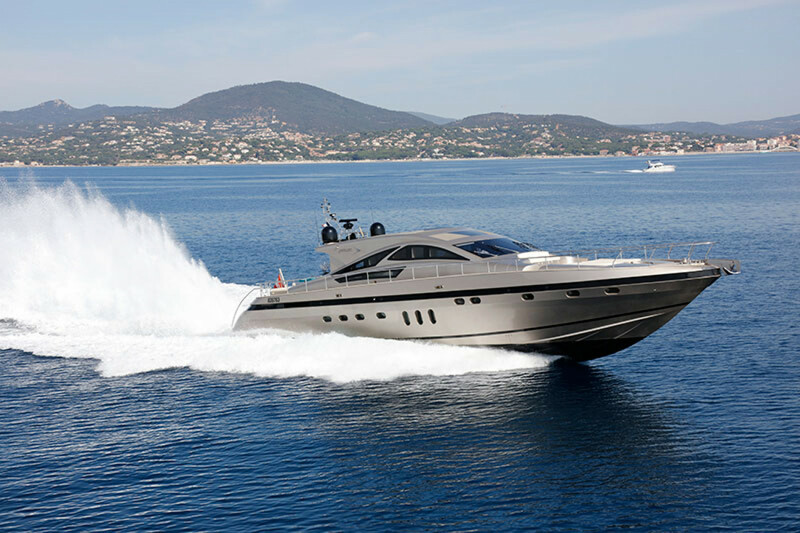 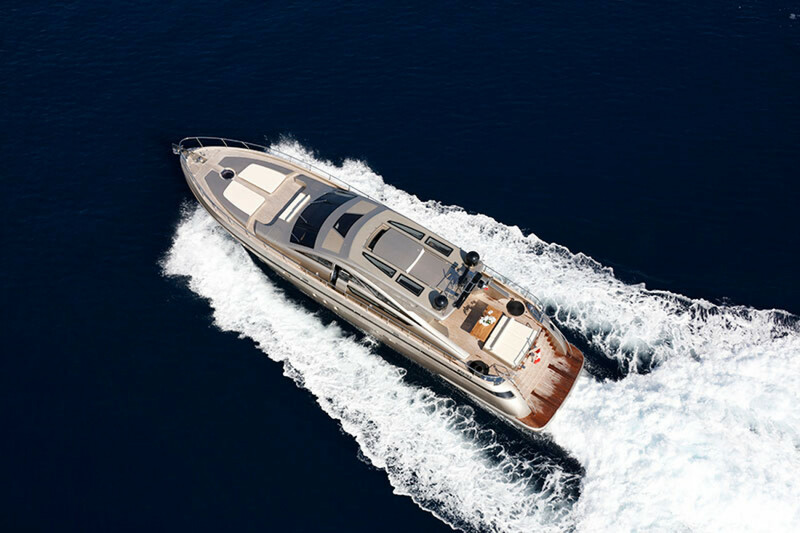 The Italian Yachts 80 Jaguar Sport is a super sport yacht bearing the signature of emerging designer naval architect Roberto Angel, who conjugates a sporting soul and comfort in a masterly measured blend. 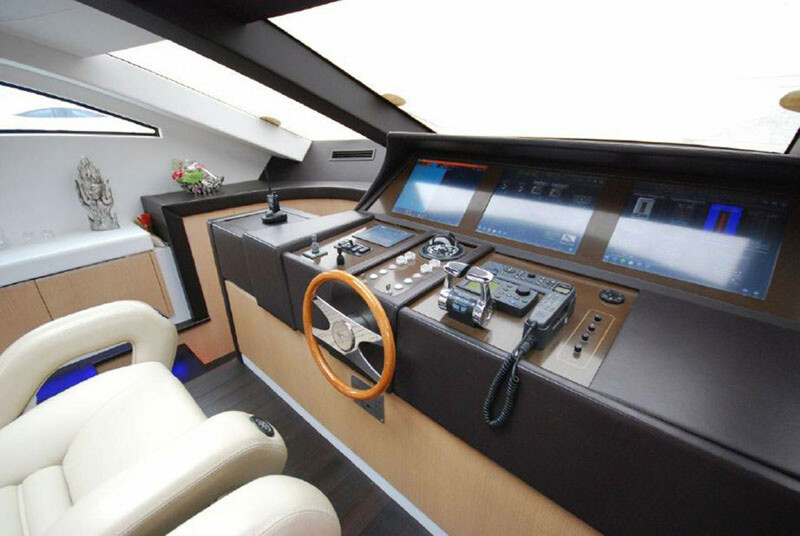 Hull, deck and superstructure are of fiberglass-reinforced polyester and vinylester resin, single-skin plating and vacuum sealed sandwich composite. 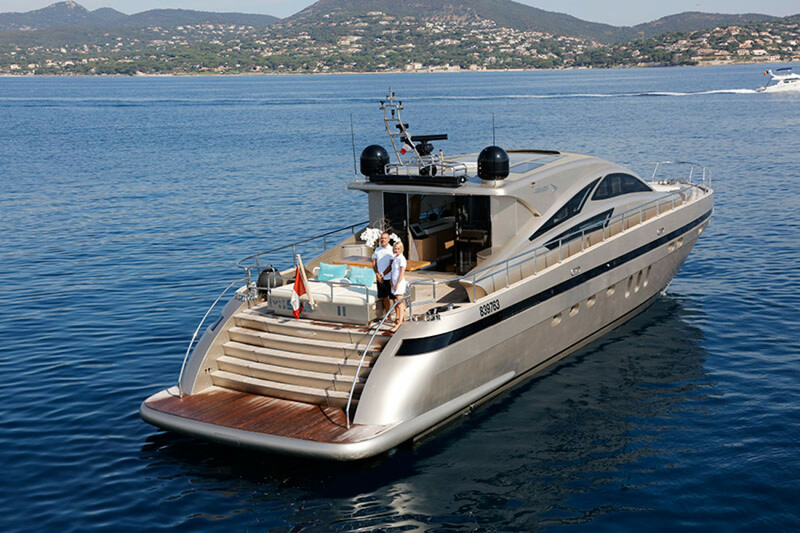 Outer walkways, cockpit, helm station and external steps are teak covered. 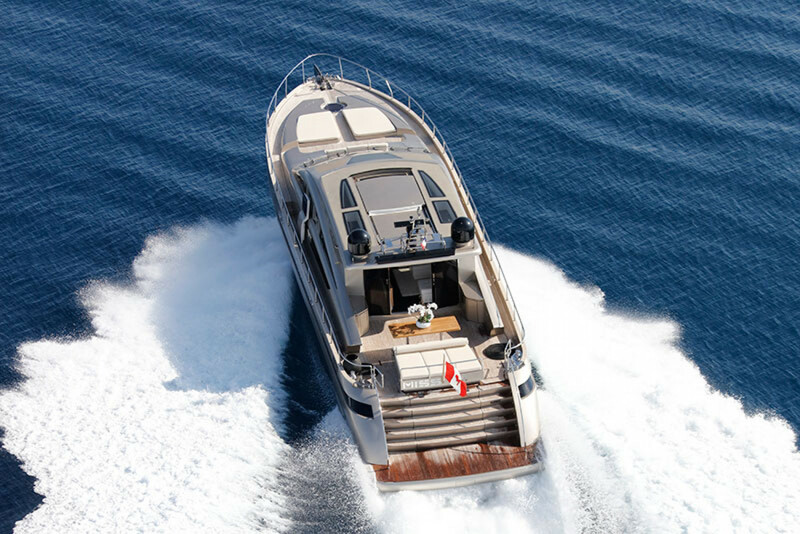 Hull shape is a modified vee with a deadrise angle of 15 degrees aft ensuring performance and excellent sea keeping in adverse sea conditions. 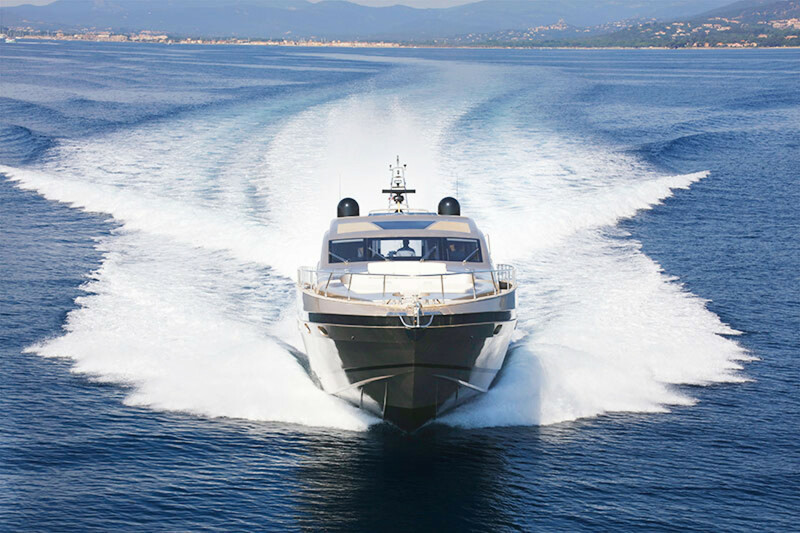 Engines are twin MTU engines that deliver 1,800 hp each and have only 370 hours. 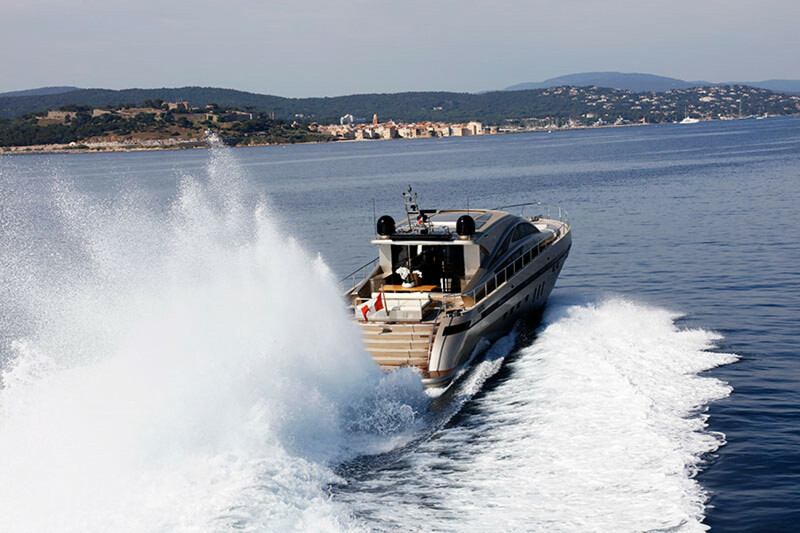 A garage is built aft, accessed via an electrohydraulically operated door, to house a 3.50m hydrojet tender. 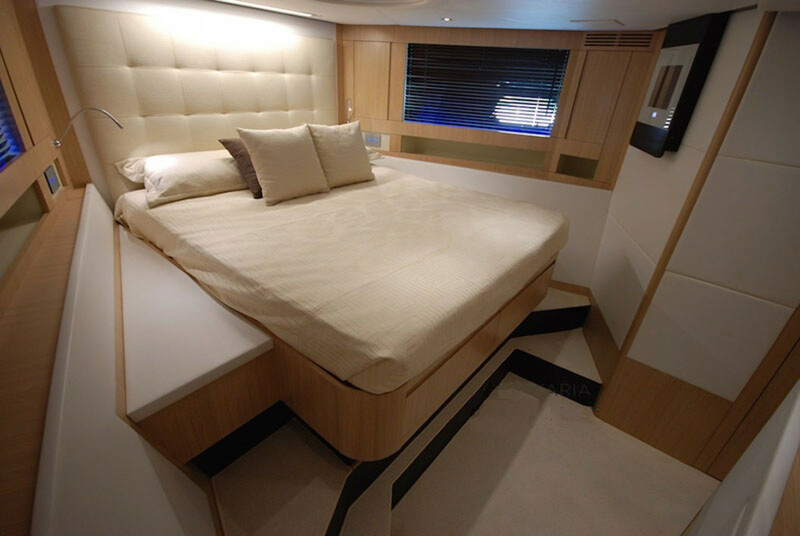 Also aft forming an integral part of the hull is a teak swim platform which also protects the transmissions below. 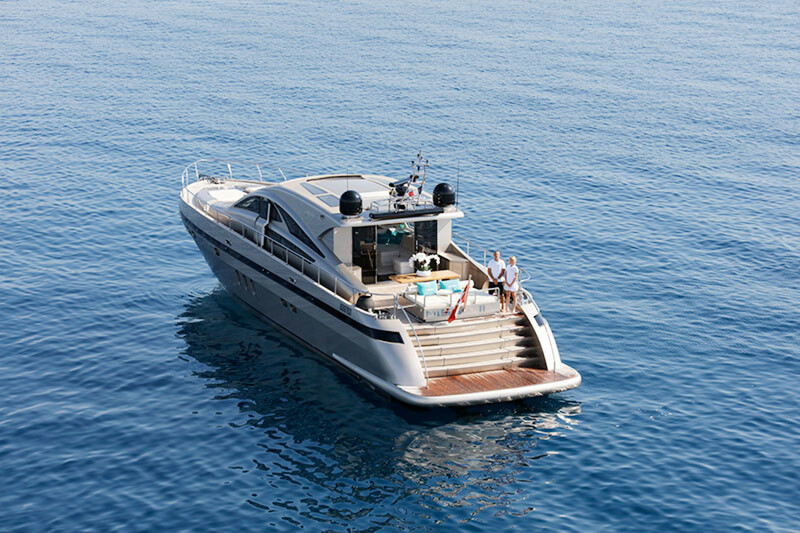 Electrohydraulically operated, a retractable swim ladder serves the platform. 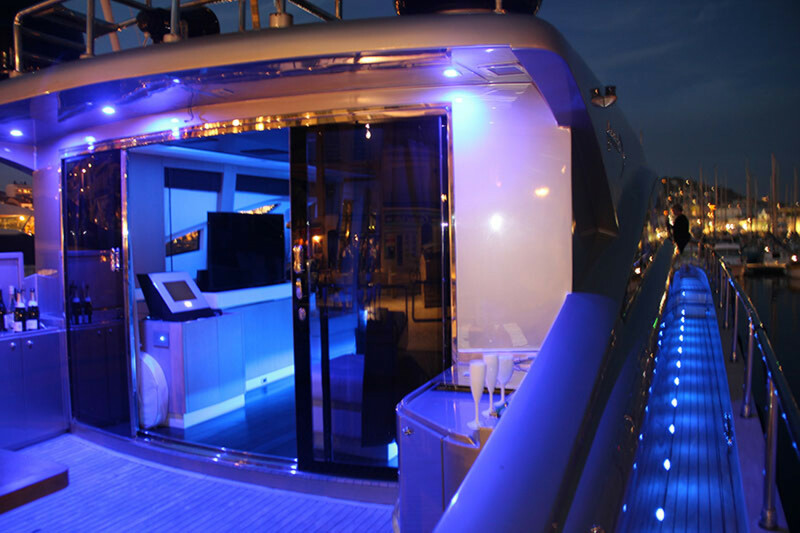 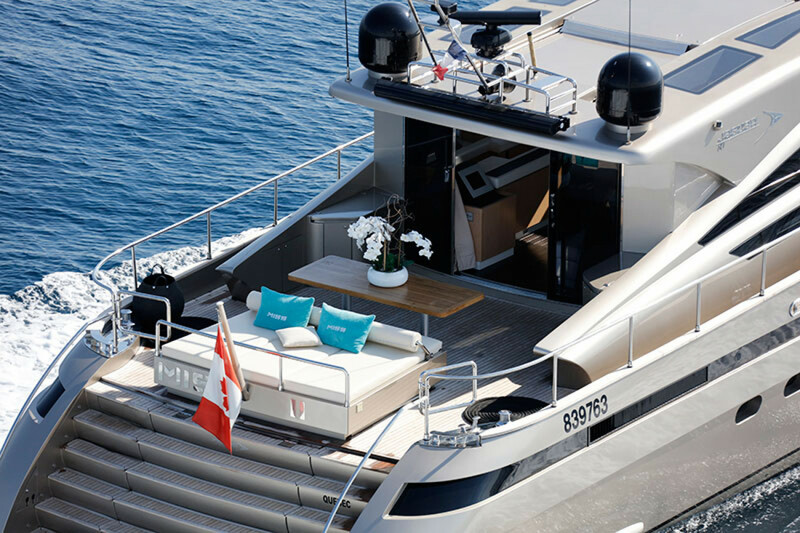 Large superstructure windows enable exceptional luminosity of the upper deck salon, that is ideally partitioned into distinct midship convivial space and forward helm station. 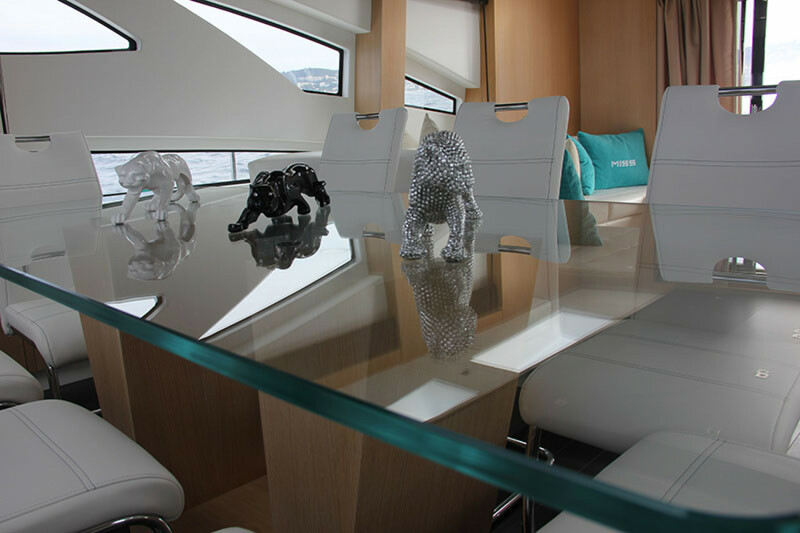 Interior design style for Jaguar 80 Sport is marked by a contemporary, sophisticated minimalism, consistent with exterior lines and is individualizable to reflect client desires. 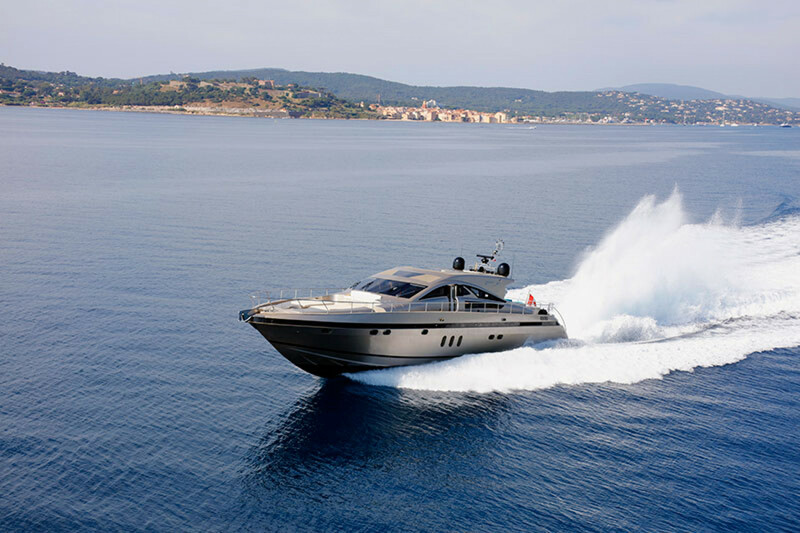 Jaguar 80 Sport has summer and winter air conditioning that maximizes the comfort of interior spaces, also featuring television and Hi-fi systems. 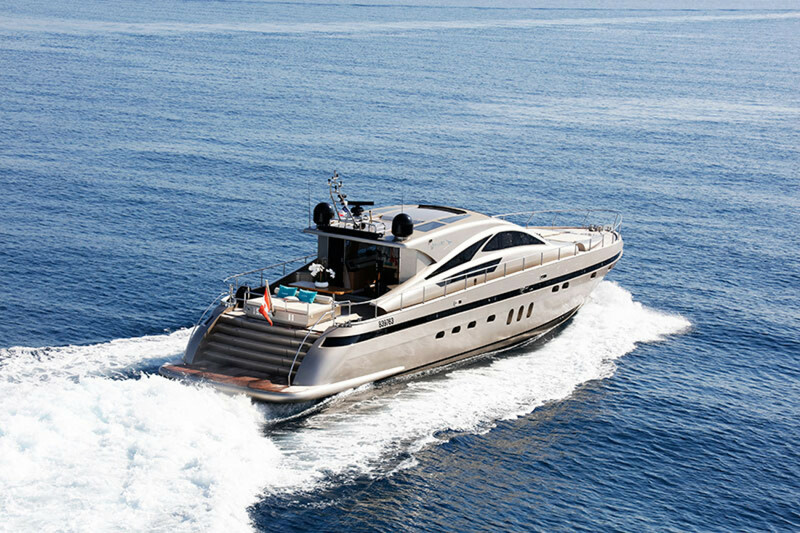 Exterior lines are clearcut and essential, scanned by arched lengthy side windows that make a slender, lighter superstructure. 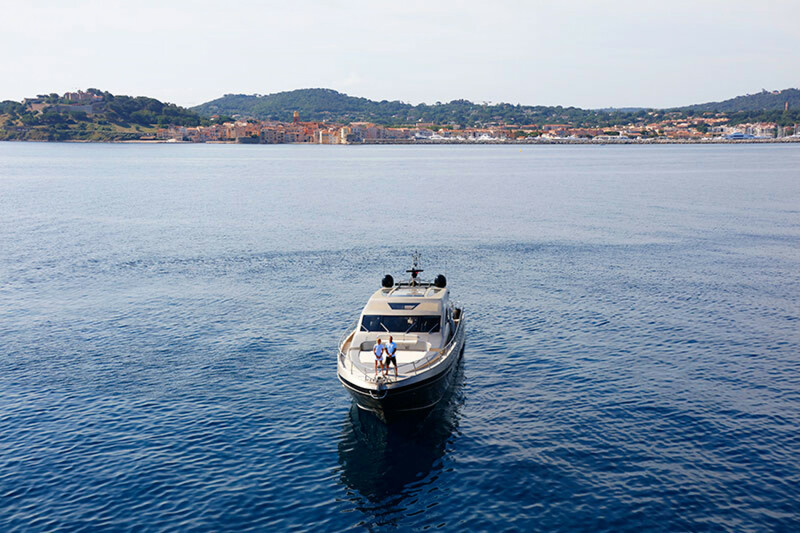 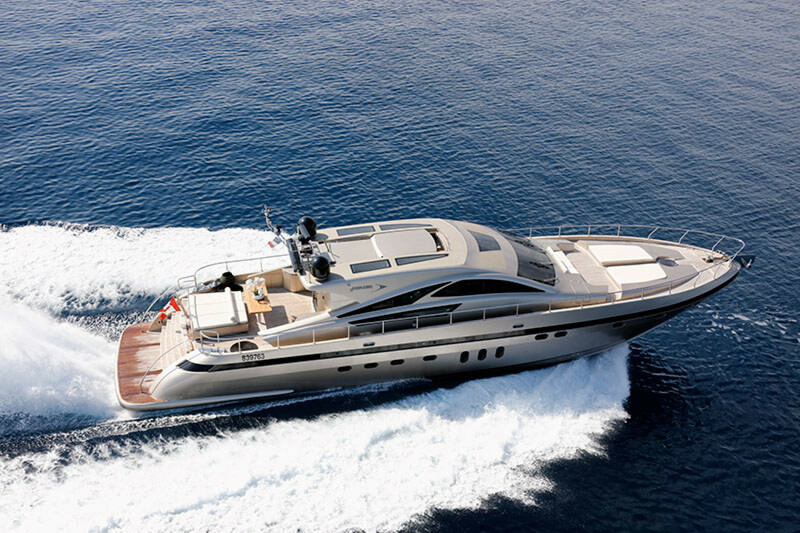 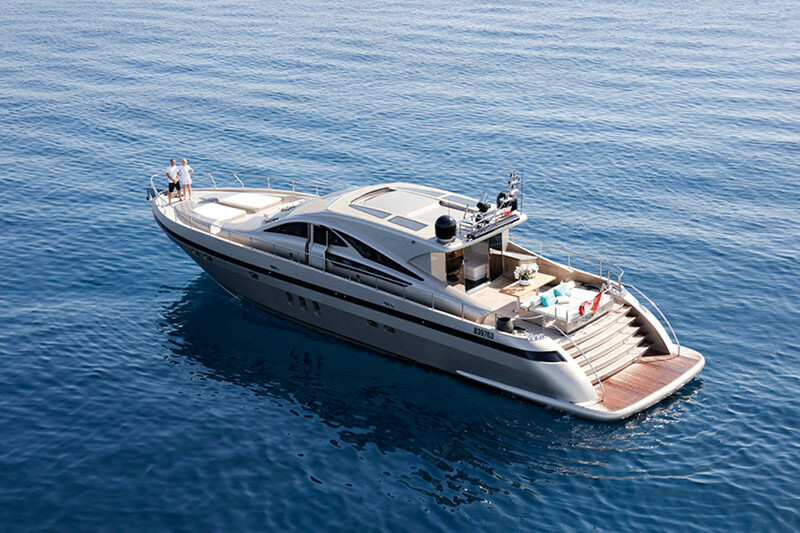 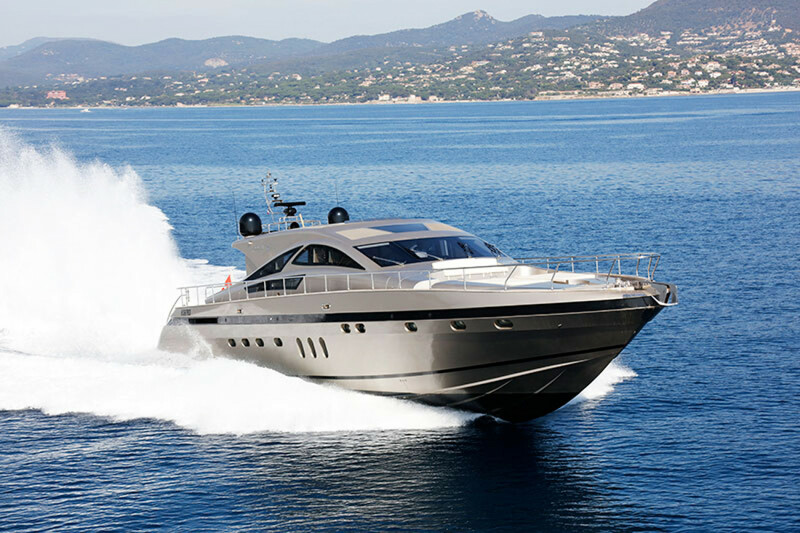 This new Italian Yachts features new forward living spaces with sun lounge, redesigned sidewalks that facilitate onboard circulation, a livable cockpit that has central seating transforming into a sun lounge, and a large helm station aft protected at the sides by sloping bulwarks. 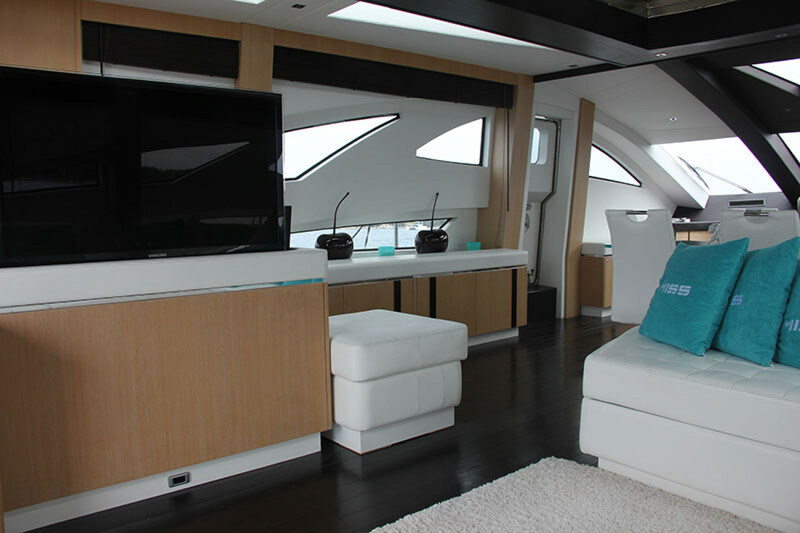 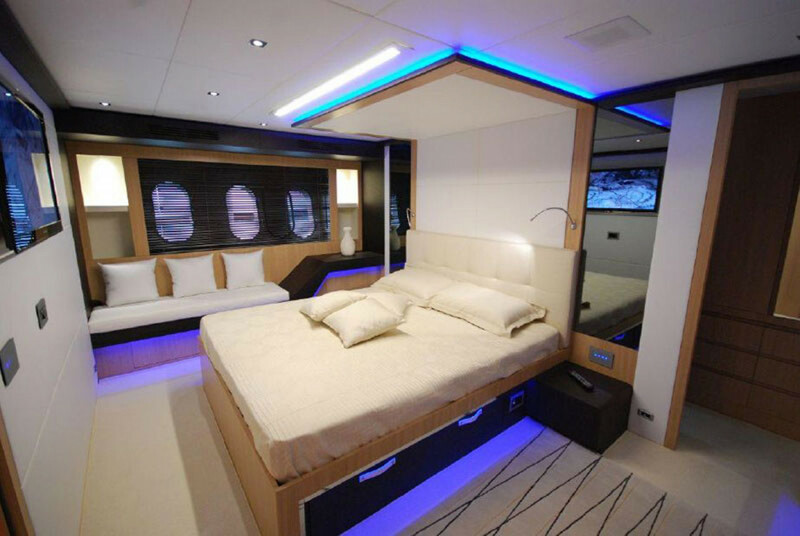 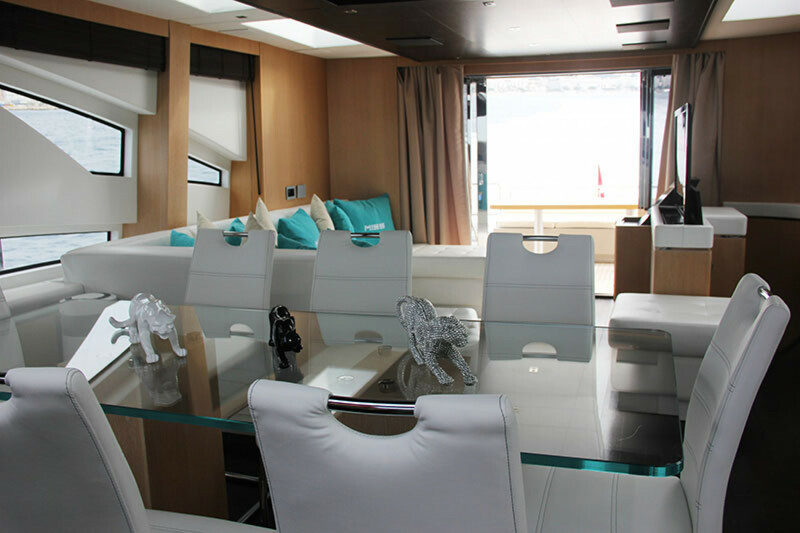 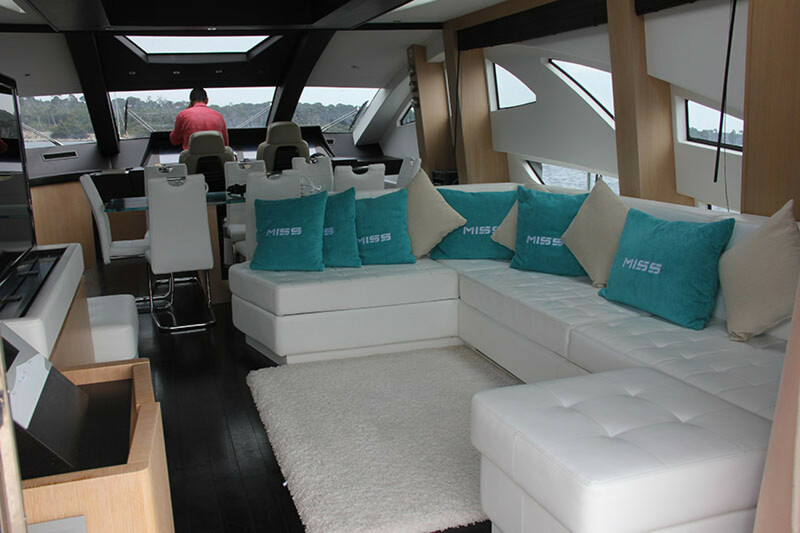 There is access to the aft galley from the upper living room. 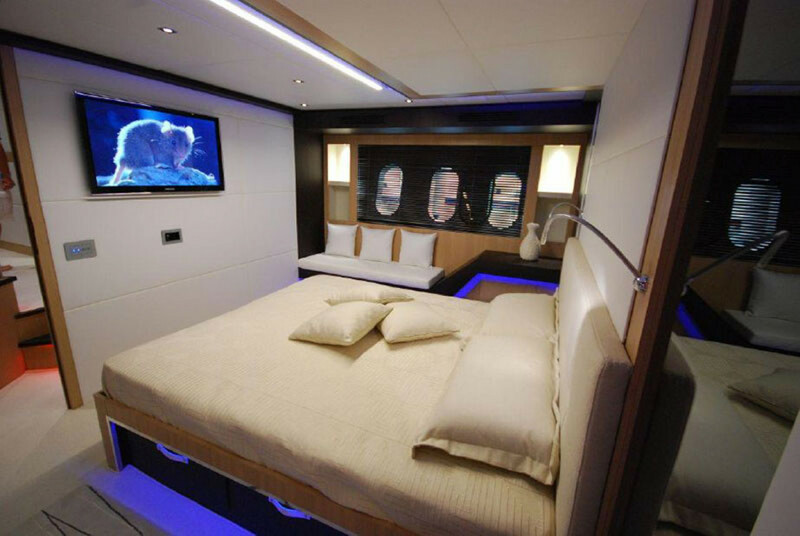 A new style and layout were also central to the focus for redesigning interior spaces based on two guest staterooms plus two crew accommodation, forward VIP stateroom and central full-width master stateroom. 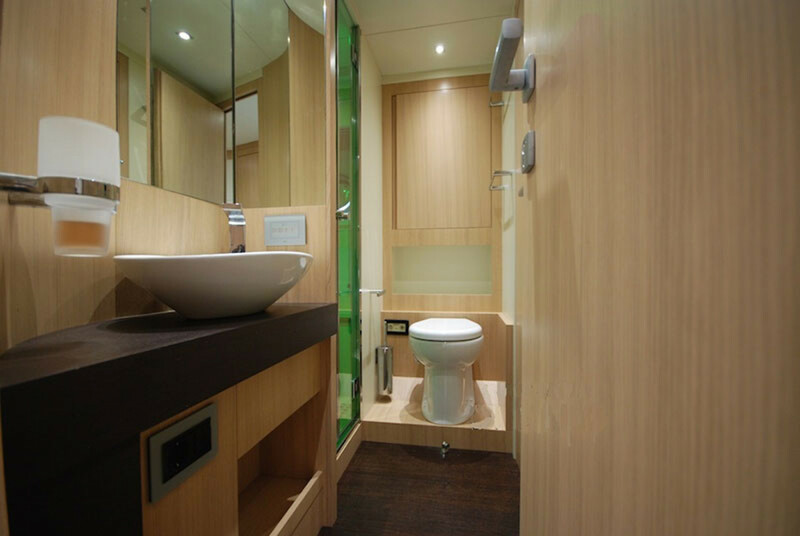 Each room has private facilities. 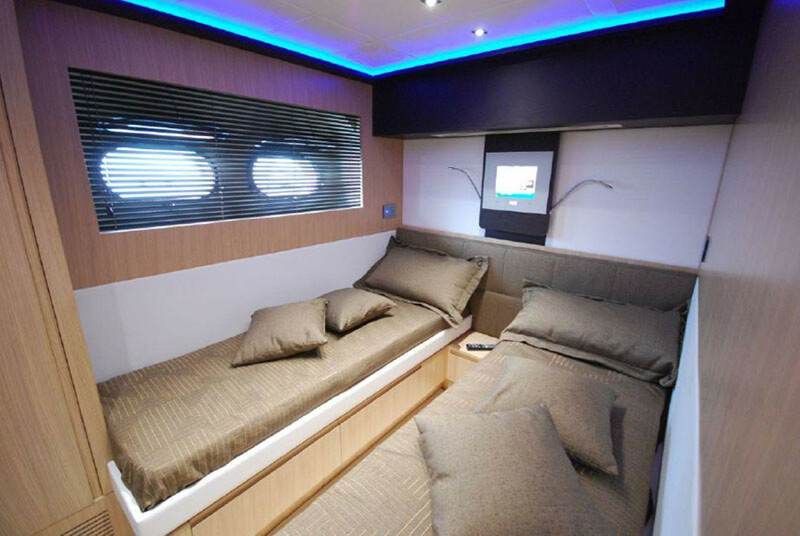 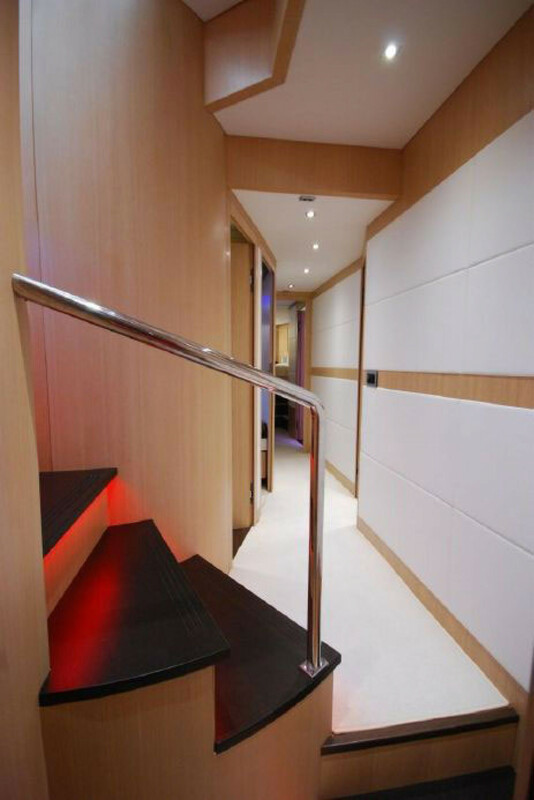 Separate crew quarters protect the privacy of owner and guests.